There are new calls to ban the registration of cars equipped with faulty Takata airbags. Picture: Supplied. THE car industry has renewed calls to cancel the registration of vehicles that have not yet had their potentially deadly Takata airbags replaced. Over the weekend the South Australian government became the first jurisdiction nationally to enforce a registration ban on affected vehicles - if the parts are in stock and the recall has not been completed. The industry wants other states, including Queensland, to follow because some customers are ignoring multiple recall notices. The registration ban in South Australia only affects the most dangerous "Alpha" type of Takata airbags - which have a 50:50 chance of spraying shrapnel in a crash. About 15,000 out of a batch of the 90,000 "Alpha" type Takata airbags remain on Australian roads. 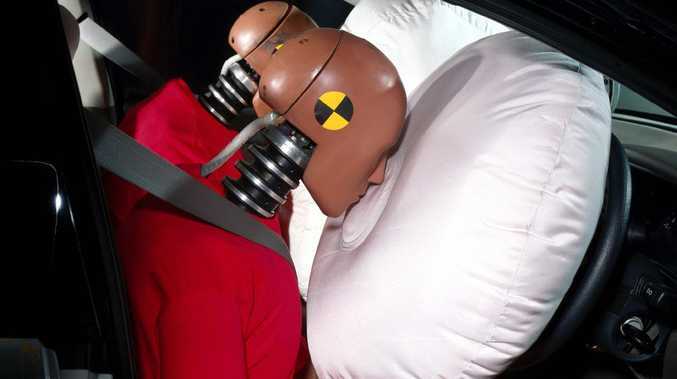 The warnings for "Alpha" type Takata airbags - fitted to certain models from Toyota, Mazda, Honda, Nissan, Lexus and BMW from 2001 to 2004 - are so serious they advise owners to stop driving their vehicle until they can get it fixed. There are still approximately 1.8 million vehicles on Australian roads fitted with another type of Takata airbag which can also prove deadly, with a 1 per cent chance of spraying shrapnel in a crash. These late model Takata airbags have already claimed one life in Sydney and seriously injured a driver in the Northern Territory. Faulty Takata airbags can spray shrapnel when deployed in a crash. Picture: Supplied. Car dealers are banned from selling cars with any type of faulty Takata airbag and must disclose to buyers if the car they intend to buy is on the recall list. Private buyers are, so far, exempt from the same requirements. Anyone can check if their car is affected by going to www.ismyairbagsafe.com.au and typing in their registration or vehicle identifying number (VIN). Compounding the issue is the fact that some customers are ready to bring in their cars but the parts aren't available for several months. Other owners are ignoring multiple recall notices even though the parts for their particular car are in stock. The automotive industry says it has prioritised the recall by fixing the oldest cars first because those airbags are more vulnerable to becoming unstable and exploding with too much force when deployed in a crash. The Federal Chamber of Automotive Industries says others states should follow SA's lead. Earlier this year the industry wrote to all states and territories requesting tougher measures to encourage motorists to get their cars fixed. "What is needed now is for all other state and territories to immediately follow the SA example," said Mr Weber, who added the industry had been doing its "absolute utmost" to raise awareness about the seriousness of the Takata airbag recall. "But we can only do so much, and state and territory governments have a significant role to play. We know that elsewhere, such as in Japan, there has been a similar tough response through refusing vehicle registration to affected vehicles." 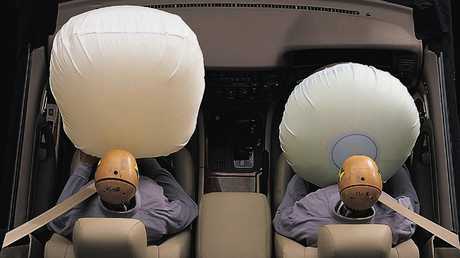 Airbags look like pillows when shown in advertising material but they are in fact an explosive device. Faulty Takata airbags can deploy with too much force. Picture: Supplied. Mr Weber says "Alpha" type Takata airbags are the most dangerous. "Preventing people from simply re-registering these vehicles reduces the risk enormously," said Mr Weber. But experts also want better enforcement of recalls for late model cars with Takata airbags. A spokesman for the National Roads and Motorists' Association, Peter Khoury, said: "Because of the safety risk we'd support any measures to get these cars fixed ... equal weight should be put on the vehicle owners and well as the vehicle manufacturers to address this serious safety issue." In April, a senior car industry executive, who represents one of the brands affected but who asked to remain anonymous, said: "If after every avenue has been exhausted then the state and territories must refuse to renew the registration or the transfer ownership of affected vehicles. 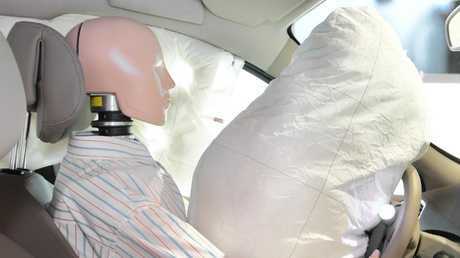 It only takes one of these faulty airbags to kill someone." A statement from NSW Roads and Maritime said it is "reviewing a number of options (and) will continue to work closely with all relevant agencies, industry and regulatory bodies". 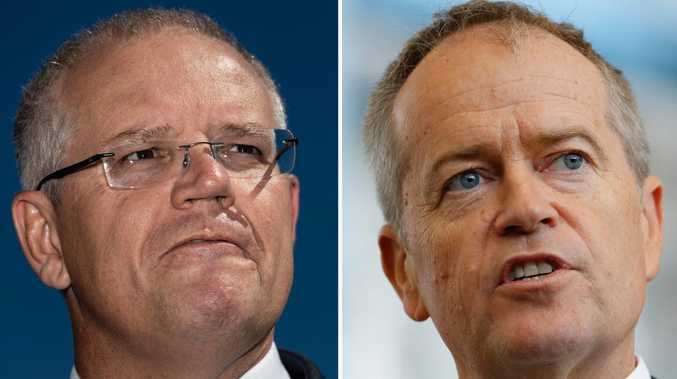 News Corp Australia has contacted the transport departments for each state and territory and asked if they will follow the SA Government's lead by not allowing affected cars to have their registrations renewed. We will update this story as they respond.